Are you a business person looking for an elite travel companion? Etihad Business Class A380 and 787 provides a unique way to travel with ample space to rest, work, play and socialise. The modern design, coupled with superb services will give you a travel experience that is out of this world. The A380s operate between Sydney, Melbourne, Abu Dhabi, New York, London, Mumbai and Paris. Business class guests get free chauffeur services. You can request for a chauffeur 24 hours prior to your flight. The services are available in more than 40 cities for first and business class guests except for business saver tickets. At Etihad Terminal 3 in Abu Dhabi, guests are greeted by the porter on arrival and then escorted to the check in reception. The airline has luxury lounges where guests can enjoy free Wi-Fi and 5-star dining. The Six Senses Spa gives you the opportunity to shower and even get a spa treatment. The seats recline into a fully flat bed with direct aisle access, giving you comfort on a long flight. The airline has made naptime more relaxing by providing comforters, pillows, back support, adjustable headrest and cushion firmness. 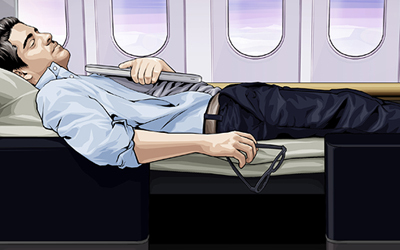 If you are on your way to an important event, you get to sleep soundly on the flight and reach your destination with enough energy for the day’s events. The 787 business class seats alternate between being closer to the window and being closer to the aisle. Seats closer to the window face forward, while the ones closer to the aisle face backward. Forward facing seats are closer to one another and thus suitable for those traveling with partners. A380 seats measure 73 by 20 inches. The fully flat bed is 73 inches with ample room to stretch your legs. On the side of the seats, there is a storage compartment and a counter. Some compartments can open providing a larger storage area for travelers who need it. In front of the seat, lies a large counter where the seat and entertainment controls are located. Seat control functions are easy to operate. If you have an issue handling them, the flight attendants will help you out. There are power outlets beneath the seats for guests who may require them. Etihad Business Class relaxation extends further with mood lighting. You also get to enjoy personal lighting and in-seat massage functions just at the touch of a button. Etihad has a great team of flight attendants whom you can raise your concerns to if you are not comfortable enough during the flight. Business class guests get a limited edition amenity kit with customized Etihad Airways LUXE City Guide and an exclusive unisex comfort kit and skin care. Etihad Business Class onboard café services offer tea, chocolate, coffee and light snacks. You can dine anytime you wish. Their menu has a wide range of options to suit different tastes. Their experienced food and beverage managers will guide you through the menu options and give you the best recommendations based on your preferences. Wines served at Etihad are not mass produced. They are chosen from smaller vineyards giving them a special taste. Usually, menus are placed by your seat when you are boarding. You get to choose from Middle Eastern and Western dishes, and the A la Carte Menu. Guests can also keep in touch with their families and friends, thanks to the connectivity ports and Wi-Fi in selected flights. You can pay for wireless Internet access using credit cards or vouchers. The cost is roughly $5 for 30 minutes. 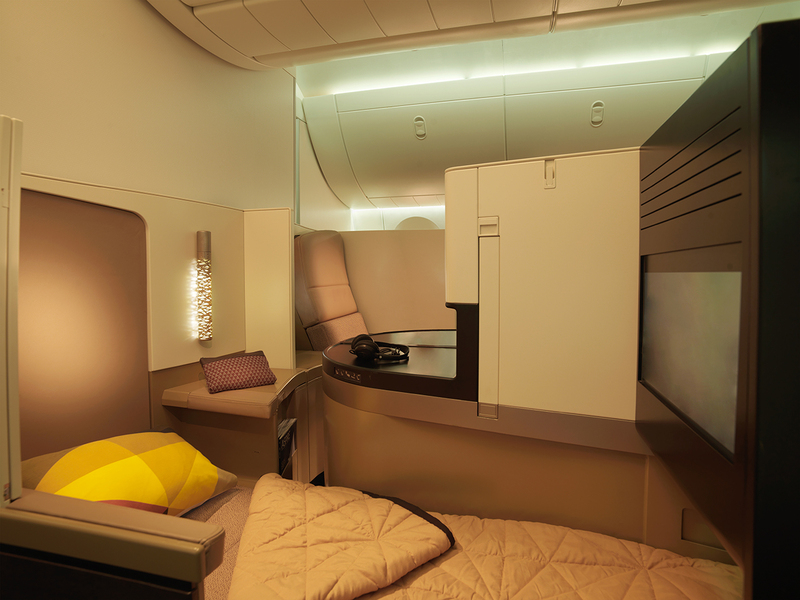 The upper deck of A380 comes with a lobby, where guests can relax and socialize. The lobby accommodates up to six guests. It is fitted with seatbelts, connectivity ports and power supply. Magazines and newspapers are available for guests who love reading. Etihad Business Class flights provide both luxury and comfort. The stress-free check in, comfortable seats, in-flight entertainment and mouthwatering cuisines, is an experience worth looking forward to.